I’m delighted to be hosting Will Bashor today as he sets out on his virtual book tour with this truly absorbing and meticulously researched book. Marie Antoinette must be one of the best known-about historical figures of all time, but not the best known. We’ve all heard the famous statement, “Let them eat cake,” Qu’ils mangent de la brioche, although it’s not certain she ever actually did give this tactless response to the claim that the poor people had no bread, and we also know that she was executed by guillotine during the aftermath of the French Revolution. And for most of us that’s just about it. But there was so much more to her than that. 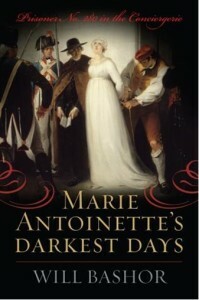 In Marie Antoinette’s Darkest Days, historian and author Will Bashor recounts the dreadful experiences she went through between the beginning of August 1793 until her death in mid-October. Her husband already dead, separated from her sister-in-law and children she languished in a filthy prison. Yet she showed resilience and dignity in the face of hatred and enemies baying for her blood. The book reads, I think, more like a novel rather than a history book, in that while the authors shares a tremendous amount of painstaking research with us, we’re never overwhelmed and the pace is crisp. Our tragic heroine develops before our eyes and we feel empathy for her in her wretched circumstances. She stops being a figurehead and becomes a very real person to us. Yes, she had been one of the royal family who knew no restraint in flaunting their wealth and acting insensitively and unsympathetically towards their subjects, but that was how life was then. There was a chasm between the haves and have-nots. You can understand why the people wanted to redress the balance somewhat, or at least attempt to. With the forthcoming elections here in France, it is somewhat ironic to realise that once again there is a widening gap between the people and those that govern them – there are many millionaires in the government these days. Did poor Marie Antoinette die in vain? These miseries were perhaps every bit as disturbing as the presence of the guards, who violated her modesty as they watched her change clothes. When the queen discretely removed the bloody dressings, Rosalie disposed of them secretly but with great difficulty; the inspections were multiplying at all hours of the day and night. And the noise became unbearable, with the locks continuously clanking and the door of the queen’s dungeon screeching as deputies entered and exited. On October 3, Deputy Jean-Baptiste-André Amar of the Committee of General Security decreed that 129 deputies of the Gironde party be denounced as outlaws, arrested, and brought to trial. The Girondins had campaigned for the end of the monarchy but came into conflict with the more radical Jacobins. On the same day, a large number of the Girondins were imprisoned in the Conciergerie, the same prison that housed the fallen queen of France. That these Girondins would be tried and most likely face the guillotine before the queen sparked another public controversy. They argued that the queen was the “guiltiest of all” and “her head should be the first to fall.” The committees, clubs, and cafés of Paris were all calling for a speedy trial of the Agrippina, a reference to the ruthless, domineering, and violent mother of Nero. Posted in Book reviews, Kindle, Non-fiction, Uncategorized.Tagged book review, French Revolution, Marie Antoinette, Will Bashor. I have the utmost respect for the amount of research historical authors have to put in to write their books. Not sure I’d want to read it though. I have to confess to being a bit of a history buff!